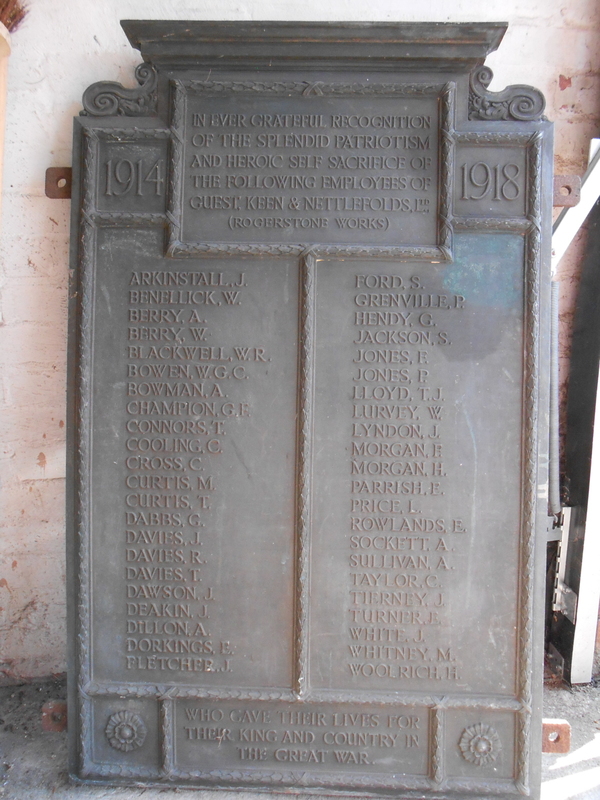 Numerous companies erected memorials to their employees who were killed in the First World War and Welsh companies, works, railways and other industrial employers are well represented in the range of known and surviving memorials. One of the larger Welsh industrial employers of the opening decades of the twentieth century was Guest, Keen & Nettlefolds Ltd, which owned steelworks, engineering works and collieries located mainly in south east Wales. The company had been created in 1902 by the amalgamation of earlier companies, amongst them Nettlefolds Ltd, whose Birmingham factories dominated UK production of wood screws. The steel that formed Nettlefolds’ raw material was made in the company’s Castle Steelworks at Rogerstone, a short distance north west of Newport. Castle Steel Works had opened in 1888 as the successor to an earlier iron works of the same name at Hadley near Wellington in Shropshire when Nettlefolds converted from using wrought iron to using steel as the raw material for wood screw manufacture. Many of the workmen from the original Castle Works migrated to work in the new Castle Works, followed by their families. The ‘Shroppies’ secured many of the skilled jobs and formed a distinctive community within the Rogerstone area. Lloyd George, Minister of Munitions in the early part of the First World War, famously declared that Britain was ‘fighting a steel war’, so crucial was the availability of steel supplies to the war effort. From November 1915 most UK steelworks came under Government control, including Castle Works. In the early part of the war many steelworks reported labour shortages resulting from enthusiastic rates of volunteering. After the industry came under Government control, skilled men were mostly prevented from volunteering; after conscription began in 1916 unskilled men in essential industries, including steel, were increasingly ‘combed-out’ and conscripted. 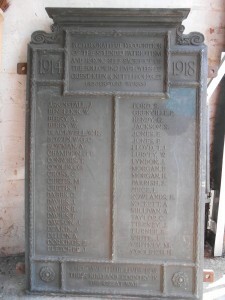 The Castle Steel Works memorial plaque lists many distinctively non-Welsh surnames and it is likely that descendants of the ‘Shroppies’ are well represented although it should also be recalled that the industrial areas of Monmouthshire experienced much emigration from Herefordshire and adjoining counties in the late nineteenth century and in the opening years of the twentieth century so not all the ‘English’ surnames necessarily originated in Shropshire. GKN commissioned similar bronze plaques for its other works, mines and factories. Whilst the wording (“In ever grateful recognition of the splendid patriotism and heroic self sacrifice of the following employees of Guest, Keen & Nettlefolds, Ltd.”, followed by the name of works) was consistent across all known plaques, the design of each plaque varied, especially with regard to the forms of the ornate borders and the arrangement of the fields in which the text (often divided in two), years, and lists of names were placed. There appears to have been a distinct policy of subtle variation within a broadly uniform ‘company design’. All the deceased are listed in alphabetical order by surname and forenames represented by initials. The plaque is not inscribed with the name of the foundry that cast it. GKN possessed a number of foundries capable of producing this quality of casting and it is possible that the plaques were designed and cast in-house. 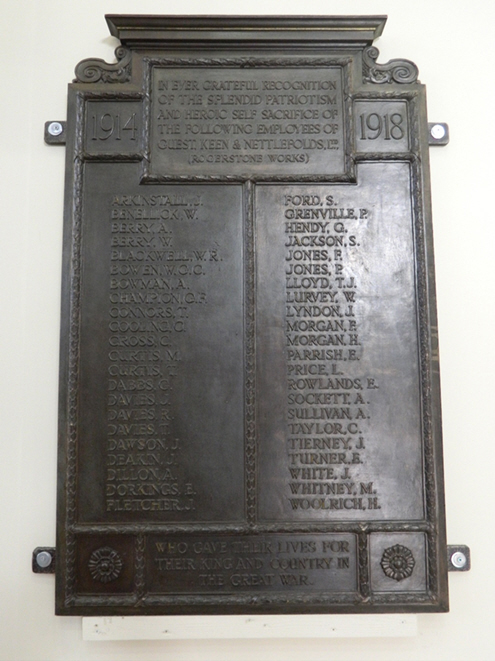 It is at least equally likely that the plaques were commissioned from a specialist external foundry. Comparison with GKN’s other sites suggests that the Castle Works plaque was probably placed in the steel works general offices. 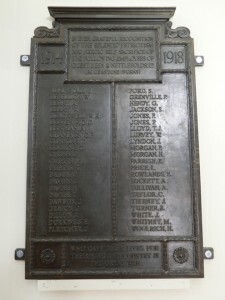 When the Rogerstone works was replaced by the third Castle Works in 1938, located in Cardiff, the plaque moved along with many of the employees. After the Cardiff works came under new ownership in 1981, the Castle Works general offices at Cardiff were demolished and the plaque was earmarked for scrap. It was saved by a private individual however and in 2015 was donated to Amgueddfa Cymru – National Museum Wales jointly by the individual and the successor company that owns Castle Works Cardiff.